13641: A. A. Waterman 70: rare oversize black chased hard rubber slip-cap twist-filler, 15 cm long, nickel plated trim, #7 Modern nib with characteristic trefoil vent hole, opens wide with minimal pressure. Good chasing and strong imprints, including the infamous "NOT CONNECTED WITH/THE L. E. WATERMAN CO." disclaimer. Hard rubber has been professionally dye-reblackened. 12614: American Fountain Pen Co. Moore's Non-Leakable: mottled hard rubber retracting-nib safety, 11.7 cm long, sleeve end marked "1" and "2.50"; even wear, one flake from posting end flange (see detail). 12754: Carey eyedropper-filler in box: black hard rubber straight-cap, gold filled chased pattern overlay, 13.5 cm long, nearly identical to a contemporary Aikin Lambert, narrow feed, #2 Carey nib has been retipped, is extremely soft and should be used with a light touch; "Cecilia" engraved on barrel cartouche, cap crown disk bumped askew from dings to cap top bead (see detail); fancy box is clean with full Carey markings on the interior. 12957: Century eyedropper-filler: black chased hard rubber taper-cap, 15 cm long, over and under feed, imprint with 1893 patent date. Moderate even fading, imprints and chasing are sharp except where heat-softened towards front of barrel, nib is usable as is but has lost its tipping. 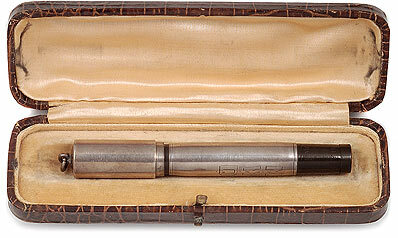 An early pen of excellent quality, from a company closely tied to Parker. 13807: Conway Stewart 28: lavender candystripe lever-filler, gold filled trim, 12.8 cm long, evenly faded from red (original color visible inside cap and on front part of barrel), #5 nib has worn imprint but is a smoothly calligraphic writer, plating losses to clip, good overall appearance, cap posts only very loosely on barrel end. 11212: De La Rue Onoto set in box: black hard rubber plunger-filler, 14.85 cm long, gold filled barrel overlay, matching cap crown, both with French hallmarks; #3 Onoto nib is an unusual sharp-edged italic with considerable flexibility. Boxed with a De La Rue patent injector pencil that appears to use 1.1 mm lead, but requires repair; pencil has some brassing, and comes with a well-constructed lead holder of hard rubber with a gold filled overlay; box interior rather tattered. 13465: De La Rue Onoto: long black hard rubber plunger-filler, gold filled barrel overlay, 15 cm long, responsive nib, French hallmarks on 1922 patent clip and overlay; brassing to clip but none to overlay, cap threads that connect upper and lower parts of cap have been repaired, and are now stronger than new. 13736: Eagle combination: black chased hard rubber eyedropper-filler, 15.7 cm long, nickel plated trim, pencil end uses standard 2mm drafting lead; introduced no later than 1911, this appears to have been the first mass-produced pen-pencil combo. Good sound example of later production with clip, moderate fading, imprints and chasing all good, notably precise and responsively calligraphic nib. 13747: Esterbrook Relief 314: mottled hard rubber slip-cap eyedropper-filler, 13.3 cm long, fully Esterbrook-marked, manufactured by Wirt. Characteristic bottom-vented Wirt feed, pen shows no sign of ever having been filled, ventless gold Esterbrook-marked nib has one superficial nick or tool mark on the top right tine (see detail). 12256: Hicks dip pen: long unmarked mottled hard rubber holder, 20.1 cm long excluding uncommon V-vent Hicks #5 gold dip nib. Holder has a gouge and a short stable crack at the end (see detail), does not affect function, nib is a notable writer, nice sharp smooth italic, some marks from restraightening (someone pressed a bit too hard, as it flexes with very little pressure). 11125: Laughlin doctor's pen: black chased hard rubber straight-cap eyedropper-filler, thermometer in compartment at end of barrel; 16.3 cm long, crisp and glossy, as new, never filled. 6856: Lynn Sorgatz button-filler: custom made pen modeled on Parker's so-called "Depression Pens", 12.5 cm long, vintage green pearl and black marble celluloid, gold filled trim, utilizing an original 1930s Parkette 14K gold nib and other vintage Parker parts for the internal mechanism. 11132: Mabie Todd Swan: hard rubber straight-cap eyedropper-filler with extremely rare Fleur-de-lys pattern gold filled high relief overlay; 13.5 cm long, full Mabie Todd & Bard imprint on barrel with 1880s patent dates, classic over and under feed with twisted silver wire "tail". Initial on cap, name on barrel, only a handful of examples of this design are currently known, with a silver specimen selling for over $11,000 on eBay in November 2013. 11272: Mabie Todd Swan: black hard rubber eyedropper-filler with solid 18K gold barleycorn pattern overlay, 13.5 cm long, tool marks on posting end and on section overlay (see details), but pattern and imprints all sharp and clean. #2 New York nib is sharp-cut, with classic over and under feed with twisted silver wire feed tail. 12717: Mabie Todd Swan in box: black hard rubber eyedropper-filler with full heavy 18K solid gold overlay, checkerboard pattern engine turning, 13.1 cm long, in extra-fancy original box with instructions, dropper still below pad, though bulb is hardened and broken. Pen is US-made, for the English market, slip-on clip is added and appears to be solid gold as well, total pen weight is 21g. Metal is undinged and with full London hallmarks, excellent but for what appears to be a polished-out inscription on the barrel. 12936: Mabie Todd Swallow combination: black and cream lever-filler, 15.9 cm long, gold filled trim, New York production, fine color, good imprints, eraser under cap crown, uses 1.1 mm lead, smooth and responsive #2 M.T. & Co. nib. Strong imprints, some plating wear to lower cap band, pencil mechanism loose (lead will push back in use unless cone is held to prevent rotation). 13632: Montegrappa The Elmo Pen: early production black hard rubber safety, 12.75 cm long, smooth gold filled overlay, #2 Elmo nib, Moore-style one-piece shaft and feed; cap has engraved monogram, dings to crown, cap lip has been replaced. Nib has a crack from the vent hole, usable with a light hand. The Elmo Pen was one of Montegrappa's very first models, and an overlay example is unheard of. 13425: Moore Non-Leakable: black hard rubber retracting-nib safety with smooth gold filled overlay, 12.1 cm long, Moore #2 nib; one shallow ding and some pinprick marks to the cap, small patch of corrosion at front of barrel overlay (see details), safety post inside cap is absent. 13222: Osmia Supra Progress 196: large grey-green pearl pump-filler, 13 cm long, gold filled trim, unusual Vacumatic-style filling system, transparent barrel with web patterning, notable two-tone nib is an elegant writer. Overall condition is fine to excellent, but for heat shrinkage to marbled area at end of barrel. 13753: Parker Duofold Junior: rare and unusual Canadian button-filler in orange Permanite (celluloid) but with giant barrel imprint normally seen only on early hard rubber pens; 11.6 cm long, gold filled trim, single raised cap band, nib is notably calligraphic. 13414: Parker Duofold Special: black streamline button-filler, 12.7 cm long, gold filled trim, made in Canada, some posting scratches to barrel from cap, enjoyable nib. 13599: Parker Vacumatic Debutante: Golden Pearl laminate, 11.75 cm long, striped jewels and section, scarce "star"clip; good barrel imprint with 2nd quarter date code, fine barrel transparency, notable factory stub nib, original aluminum Speedline filler has been replaced with a 1940s plastic-plunger unit. 13546: Record safety: miniature ringtop, black hard rubber with 18K gold filled octagonal overlay, 8.2 cm long, excellent but for one small ding to the side of the cap. "Record" pens were made by Cavaliere of Milan, the leading producer of metal overlays in Italy and supplier to Waterman, Montblanc, Astoria, and others. 11211: Unic Duocolor: French-market version of Zerollo's famous two-nibbed fountain pen, boldly patterned red and black hard rubber, 13 cm long, gold filled trim, bold imprints with patent number and both Unic and Zerollo names, crisp knurling at cap top. Condition is like new, noting a tiny nick to the cap lip (see detail; very common on these pens). Unusually, the nibs are different in tip width, one being more calligraphic and the other more suitable for note-taking. 13614: Waterman Remex: smooth black hard rubber slip-cap eyedropper-filler, 12.8 cm long, a Waterman sub-brand model made specifically for the Royster Guano Company and so imprinted; moderate even fading, nib has a stress line from the vent hole. An unusual but known model, we have seen a few examples over the years. 11921: Waterman 12: black hard rubber eyedropper-filler with London-hallmarked sterling silver overlay, bloodstone seal cap top, 13.3 cm long; Canadian #2 nib is a notable writer, some scratches and shallow marks to the silver. Presentation box has a silver badge on top for the Royal Lytham and St. Annes Golf Club. Seal-top Watermans are rare, especially in silver. 9184: Waterman 442½V in box: black hard rubber ringtop safety, 9.6 cm long, smooth sterling silver overlay with hard to find telescoping outer cap; metal clean, imprints on hard rubber strong, initials "M.W.D." on barrel. Patent imprints on feed, responsive nib. 8403: Waterman 14: black hard rubber eyedropper-filler with smooth sterling silver overlay and bloodstone cap top seal; 13.1 cm long, a rare but catalogued factory model most often found in France and England (a version appears on p. 53 of Waterman's 1908 USA catalog under "Special Mountings" as Emerald End Special Fluted, priced at $50 -- more than three times the cost of a full sterling silver Snake); London hallmarks are worn but mostly legible, one ding to the side of the cap, #4 nib with unusual turnup grind at tip; the smooth silver version of this pen is several times rarer than the fluted version in gold, which is itself quite hard to find. 8907: Waterman 472: uncommon black hard rubber screw-cap eyedropper-filler with smooth sterling silver overlay; 13.1 cm long, London hallmarks, number at barrel end is simply "72" with no hundreds column digit, as is typical for English-market Watermans; 1925-dated presentation inscription, nice stub #2 nib has an incipient hairline from the vent hole, but should be stable if used without excessive writing pressure; even wear, light marks to metal, one tiny stress crack where barrel overlay crimped in place (see detail; for some reason these are extremely common in English-market Waterman overlays). 13761: Waterman 58: oversize black chased hard rubber lever-filler, 15.5 cm long, nickel plated trim, excellent original color and gloss, has not been reblackened, a couple of scratches on the side of the cap (see detail). 10883: Waterman 58 Cardinal: giant red hard rubber lever-filler, 15.5 cm long, 18K gold filled trim, a fine example of a very scarce pen, all imprints clearly legible, #8 nib is a smooth and responsive writer; 3 mm long hairline at bottom of section mouth hard to see, does not go all the way through (see details), does not affect function. 13728: Waterman Patrician: oversize "Onyx" lever-filler, 13.9 cm long, red hard rubber ends and section, gold filled trim, all original and mechanically sound, noting typical discoloration, wear to lever plating, and engraved name on clip. 13324: Waterman 7 Ripple: red and black hard rubber lever-filler with scarce and desirable "Blue" nib and band, 14.4 cm long, gold filled trim, 9K solid gold London-hallmarked cap band; barrel imprints worn but fully present, slight even fading to hard rubber. Nib is sharp-edged, calligraphic. 12373: Wirt lever-filler: black chased hard rubber ring top, 11.4 cm long, gold filled trim, distinctive and characteristically Wirt blade-shaped solid metal lever; ventless gold nib, vented flat feed, unusual barrel construction, made from plugged tubing, hard rubber faded but chasing good, no maker imprint as is typical of these small Wirts. Comes with period suspension cord to wear around the neck.